S. LEE ELLIOTT. Sorento is truly of mushroom growth, scarce numbering in its history a decade, and yet so well organized is the town as to compete successfully in commercial interests with many of its older sisters. It commands a splendid agricultural district and the trade enjoyed therefrom is very large. Our subject, Mr. Elliott, is one of the pioneer merchants of the place and is numbered among the most substantial men here in business. He was born in Grayson County, Ky., May 20, 1856, and is the only child of George and Lucina (Kessinger) Elliott. Our subject's father, George Elliott, was a lineal descendant of Commodore J. D. Elliott, who was second in command under Perry in his memorable fight on Lake Erie in 1812, and who succeeded to the office in 1813, and was in command of the Philadelphia Navy Yard at the time of his death in 1845. The Elliott family was no doubt of Scotch ancestry, but the date and the name of the original emigrant is a matter of conjecture, but his arrival occurred, as nearly as we can learn, early in the eighteenth century. The mother of our subject, Lucina Kessinger, was, like her husband, born in Grayson County, Ky. She was the third child of William L. Kessinger, who was born in Hart County, Ky., and was the son of Joseph Kessinger. The latter in turn was the eldest son of one Solomon Kessinger, he being the son of Mathias Kessinger, a German nobleman of great prominence and wealth. Solomon Kessinger was born in what is now the province of Bavaria, near the River Rhine, in the united kingdom of Germany. He was educated by his father for a Catholic priest, but before taking the vows he became enamored with one Betsey Greenwalt, and, as the laws of the Roman Catholic Church forbade the marriage of the clergy, love, as is usual, won the day, and he forever renounced Catholicism, left his native land, fame and fortune behind, and came to America, where he met his betrothed at Baltimore. There they were married and at once went to what is now Hart County, Ky., whence the Kessinger family in America springs. We have given sufficient outline of the ancestry of the Elliott and Kessinger families to show the patrician blood that flows in the veins of the man of whom we write. He was less than a year old when brought to Illinois by his relatives. They located at Litchfield, where he was reared. He early applied himself to obtaining a liberal education, which by hard work and perseverance he completed at the Litchfield Seminary before he had reached his nineteenth year. After the close of his studies he was employed as a successful teacher in the public schools, spending three years of the time in Kansas. February 27, 1878, our subject was married to Miss Maggie, daughter of Isaac Bishop, a pioneer of Montgomery County and a veteran of the Mexican War, who died in 1863, leaving a snug fortune, a portion of which was inherited by the daughter. After marriage, Mr. Elliott continued to teach, judiciously investing his earnings in land which brought him in quite a comfortable income. 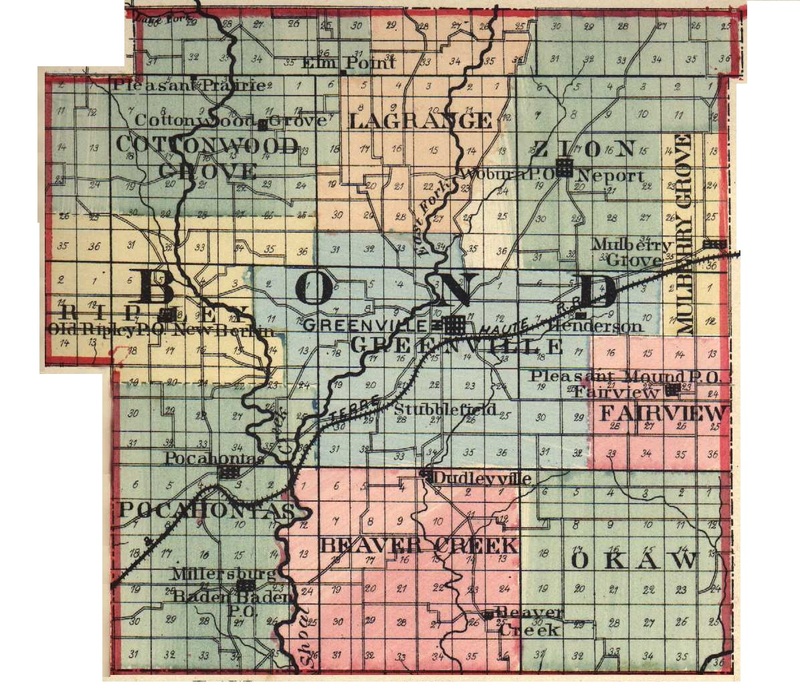 With the proceeds of his investment, in June, 1882, he established himself in business at Raymond, in the northern part of Montgomery County; but before he had been there long he saw a better field for his young and energetic mind, for on what was known as Pleasant Prairie, in Bond County, the Jacksonville & Southeastern and Charleston, Neoga & St. Louis Railway Companies had formed a crossing. The town of Sorento was laid out and we find that Mr. Elliott was among the first to establish himself in business in the new place. Moving his stock of goods from Raymond, our subject came here with the determination to develop his interests in proportion with the development of the place. In 1884, he erected a two-story brick building, and therein he is now established in the general mercantile business. He was one of the original stockholders of the Sorento Coal Company, and for four years was a member of the Village Board of Trustees. His business interests are by no means confined to the mercantile line. He is engaged in the land, loan and insurance business and formerly carried on a heavy business in buying and selling gram, and also handled large quantities of railroad ties. As he is a Notary Public he is frequently called upon to look up and settle estates. Besides giving an able attention to these various interests, he is devoting much time to improving his beautiful suburban farm, where he is extensively engaged in fruit culture. He raises a good class of stock, having upon his farm some animals that are well pedigreed. Politically, our subject springs from a long line of Whig ancestors, who all became Republicans on the organization of the party, and with this party he was identified until 1884, when he joined hands with the Prohibitionists. Since that time he has thrown all the energy and enthusiasm of his nature into the balance with his party. He is at present a County Central Committeeman, and also a local manager. He has been a life-long temperance advocate. In his church associations, he is a Methodist and no man in his locality is more devoted to the cause of Christianity than he. Greatly interested in Sunday-school work, at the present writing he is Township Chairman of the State Sunday-school Association. Modest and unassuming, Mr. Elliott is a man who makes friends with all with whom he comes in contact. Extracted 04 Dec 2016 by Norma Hass from 1892 Portrait and Biographical Record of Montgomery and Bond Counties, Illinois, pages 255-257 and 464-465.